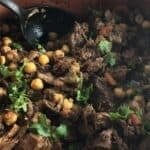 A delicious Beef and Lamb Tagine, with meat slowly braised in a blend of Middle Eastern spices. Chickpeas and eggplant bring additional heartiness and flavor. We enjoyed it with a very interesting red wine from Lebanon for the April Wine Pairing Weekend event. I was curious about tasting the fairly high end wine from Lebanon that Susan was pouring at Pairings recently. I agreed with her description that the red from Chateau Musar compared favorably with a good Bordeaux. When Susan described the natural winemaking approach of the Chateau and its organic methods, I asked it it happened to be a biodynamic winery. When she indicated that it is, I figured I had found my wine to feature for this month’s #winePW event’s theme “Biodynamic Wines of the World” hosted by Gwendolyn at Wine Predator. 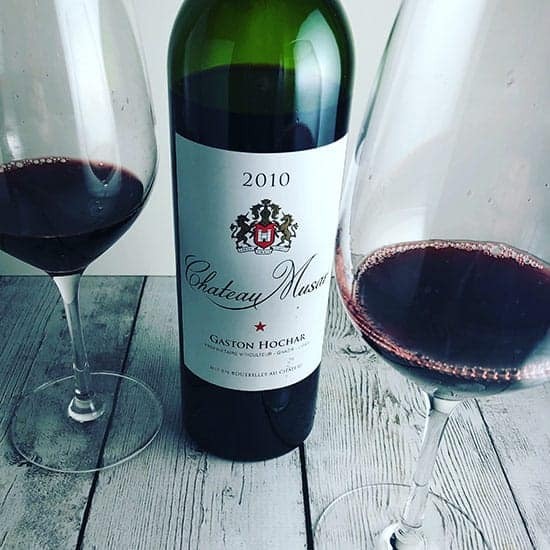 I had my wine from Chateau Musar on hand for a few weeks before I got around to cooking for it. I thought a tagine dish would be a natural pairing for this red wine from the Middle East. Somehow when recalling the various spice notes in the wine, I was thinking I had a Syrah based blend to work with. Lamb tagine seemed like just the thing. But when I got to Whole Foods, they were running low on lamb stew meat, so I rounded out the amount of meat I wanted by getting some beef. That beef substitution turned out to be fortuitous, as when I got ready to open the wine I realized that is a Cabernet Sauvignon based blend. Beef along with the lamb seemed to set up a good pairing. I also included some eggplant in the beef and lamb tagine, a veggie that is a good bridge ingredient for Cab. After chatting with one of the Whole Foods butchers about my plans, I decided to give the beef a head start so that it would have more cooking time then the lamb. That seems to be a good approach for making a beef and lamb tagine. If you are new to the term tagine, the first thing to know is that “tagine” refers to a earthenware cooking vessel with a cone shaped lid, associated with North African cooking. This cooking vessel is reported to help distribute heat evenly when cooking. You can check out some tagines here on Amazon (affiliate link). But you can make a tagine without a tagine, so to speak. Tagine can also refer to a North African stew made with meat and spices typical to the region. You can find tagine recipes calling for simmering the stew on the stove top, or braising in the oven. I prefer the latter. When braising a tagine in the oven, you are going to want to use an oven proof cooking vessel where you can start things on the stove top. 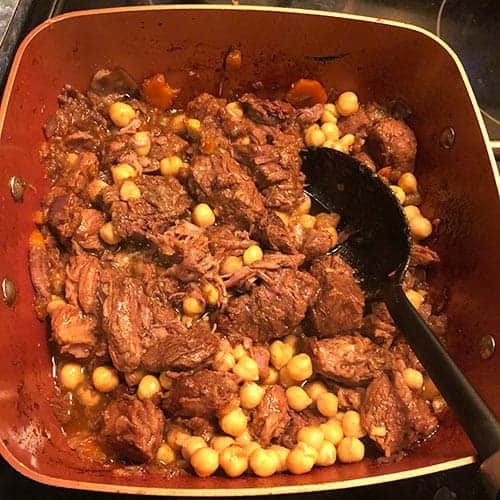 A Dutch oven will do the trick if you don’t have a tagine, but I like to use my Copper Chef pan for the job (Amazon affiliate link provided). I’ve heard some suggest you don’t need to brown the meat before braising it for a tagine. I split the different and browned the beef, then added the lamb without browning, 30 minutes after the beef had begun braising in the oven. Let’s talk more about the wine we had to pair with our beef and lamb tagine. The 2010 Chateau Musar Red ($65, 13.5% ABV) is a Cabernet Sauvignon based blend with Cinsault and Carignan. The winery suggests ample time to decant, so I decanted for an hour or so and then poured some to go with our meal. I also have a quick video on our YouTube channel where I taste this wine. Nose: Cedar chest and violets. Palate: Plum fruit, licorice, cinnamon plus other spice notes, and some underlying slate. Well-integrated tannins, long finish. A wine with intriguing layers of flavor, a pleasure to drink. The winery tech sheet suggests the spice notes are attributable to the Cinsault and Carignan. 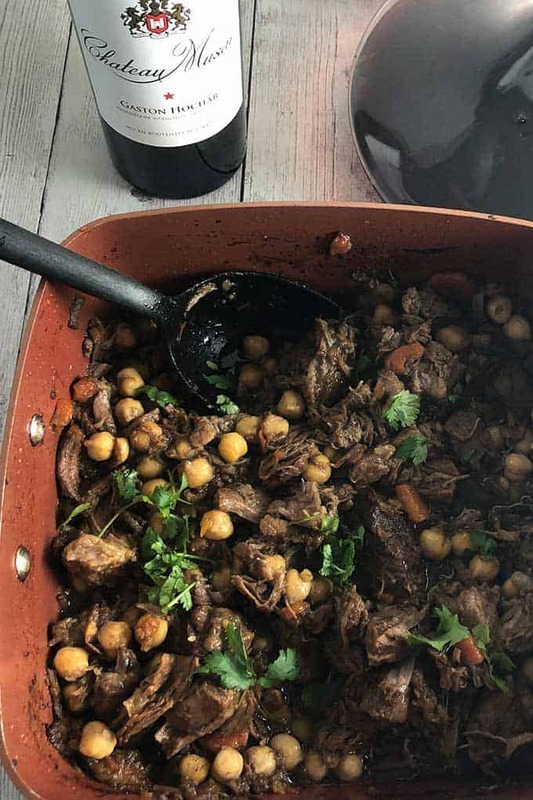 Pairing: As suspected, the Chateau Musar red blend is delicious with our beef and lamb tagine recipe! With two types of meat and a variety of Middle Eastern spices, there’s a lot of flavor going in the tagine, as is the case with the wine. And this red certainly has the structure to stand up to the meat. I don’t think of Lebanon as being a wine producing country, but the high altitude Bekaa Valley region has a winemaking tradition that goes back some 6,000 years. I learned on the Chateau Musar website that the Roman god Bacchus was worshipped in the region, and some of the best preserved temples to the god of wine can be found there. The Musar family has French roots, and settled in Lebanon back in the 12th century. Chateau Musar’s red wine vineyards are found in the southern end of the Bekaa Valley, north of Lake Qaron and about 20 miles southeast of Beirut. There’s a range of gravel and limestone soils in which old vine Cabernet Sauvignon, Cinsault and Carignan grow. Chateau Musar has always farmed organically and become the first certified organic vineyard in Lebanon in 2006. They use a low intervention, natural approach to winemaking. The winery website focuses on the terms organic and natural winemaking; they don’t explicitly use the term biodynamic. 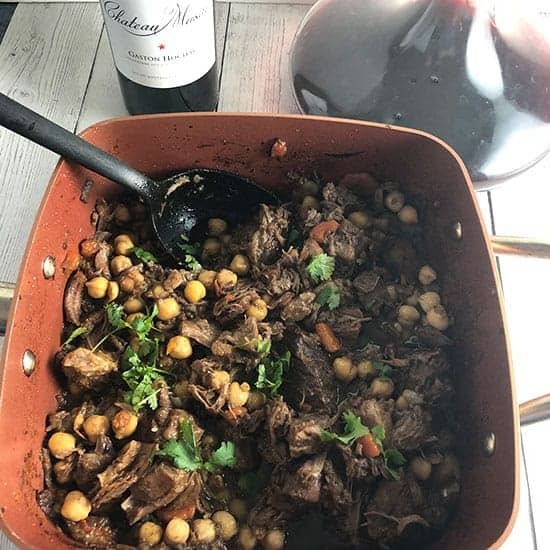 I’m not sure if I was misinformed or if the winery just doesn’t emphasize the term, but I was too far down the path of featuring this wine paired with our beef and lamb tagine to do something else for this Wine Pairing Weekend event! You can certainly check out many great articles from my colleagues (links following the recipe) that feature wines where biodnynamic is front and center. Grapes for the Chateau Musar red wine are fermented separately in cement vats, then aged for 12 months in French oak, very limited new oak. The three varietals age separately in oak for three years, and are then blended and bottled. The wine undergoes another 3 to 4 years of aging in bottle before they are released. The Wine Pairing Weekend crew is getting into the swing of Earth Month by searching out and writing about biodynamic wines of the world– and what to pair with them this month. Read the invite post here; in it Gwendolyn explains about biodynamics and shares two biodynamic reds from Mendocino’s Bonterra. We’ll be publishing our posts before our 11 a.m. ET / 8am PT chat this Saturday April 13; follow along using the hashtag #WinePW. What a delicious recipe! The meat is so tender! I had no idea Lebanon produces wine but that Chateu Musar sounds good! I love finding new Middle Eastern recipes and this turned out so tasty and tender! This dish looks amazing!! Flavorful and tender is how all meat shout be prepared! Never tried a wine from Lebanon myself. I did remember how a tagine looks like when I visited an African restaurant in Philly. Your lamb tagine seems to be a superb match with the 2010 Chateau Musar Red! Hi Pinny–I had tried one Lebanese wine before and it was nothing like this! This one would compare favorably with most French red blends. Your Beef & Lamb Tagine sounds really good. Even though I love lamb, I’d need to go all-beef as Julie just doesn’t care for lamb at all. Oh well. I really must try some Chateau Musar. We get it in Minneapolis and friends rave about it, but I have never brought a bottle home. Must remedy that! All beef would work well, I would suspect! yes, I do encourage you to grab a bottle, Jeff. Tagine looks wonderful – I may try a vegetarian version to pair with an organic or biodynamic wine. Will be on the lookout for Lebanese wine, too! I’d be curious to hear about your vegetarian tagine! Your tagine sounds wonderful. What a nice pairing. Lebanese wines haven’t even been on my radar….perhaps a future wine pw topic? That could be in the mix for 2020 Wendy! Delicious pairing, David. It’s been a while since I sipped a wine from Chateau Musar, so thanks for the reminder that I need to revisit it. Maybe I’ll try your recipe out as well. Cheers! Thanks Lauren! This was my first time try Musar and really liked it! Since my mom’s family is 1/2 Lebanese I have a soft soft spot for the Musar wines! It also helps that they’re delicious. Their whites are also fascinating if you ever have the chance. The tagine look delicious as well. I just got back from Nashville and barely missed a big Musar pairing event at Miel, a so-cool restaurant there. This means if I try your plan I do it at home. Love it! Oh that would have been a great event! A friend of mine asked me if I had a “signature” dish that I prepare last night. As much as I enjoy tagine, I think I’d like that to be it. The challenge is I’ve never really invested the time into making one. Your recipe is tempting me to do so. Thanks. Thanks Martin! I do enjoy the tagine flavors, worth the effort!